Baroness Margaret Thatcher will be remembered in totally different ways. Some people believe she was tremendous and delivered the massive change this country needed. Others believe she led to division and the smashing up of industries and associated communities. If you have been watching the myriad of TV tributes over the past day, you will also see that some people say she really was an Iron Lady, whereas others say her public image was not the woman they knew who was somewhat softer and more gentle. One thing is clear; Maggie was a Marmite Mum. You either loved her or hated her. My own reminiscences of Lady Thatcher also show this division. On one occasion I was due to attend a conference where she was the opening speaker. Indeed, the conference was her idea and involved several European heads of state. Security was very tight indeed, but somehow I lost my way and went up the wrong lift at the Queen Elizabeth II Conference Centre in London’s Westminster, opposite the Houses of Parliament. I arrived at the relevant meeting room, on the dot of 11am as the conference was due to begin. I walked in through the door, expecting to be in some ante-room being told I could not go in. But I was not. Instead, I entered the room at the back, immediately behind Maggie as she was at the podium beginning her speech. Security…? What security? I walked past her and sat down next to a colleague I spotted who simply said “Nice entrance Graham”. This is a story I often tell in talks I give because it highlights several issues – one of which is the fact that even though as Prime Minister she could well have been threatened by some unexpected visitor walking in behind her, she carried on as though nothing had happened. Determination. To me, that’s a good thing – being un-phased by things going on around you, simply determined to reach your own goals. However, I also have a negative story about Mrs T. In 1987 the former British spy, Peter Wright, published his autobiography, Spycatcher. But Mrs Thatcher led the decision to ban the book from publication. Indeed, for a year the book was indeed banned in England and Wales before the Government lost an appeal. However, so much publicity about the book was generated by her determination to get it banned that I thought it must be a terrifically revealing book. So, on my arrival for a speaking gig in Copenhagen I was quick to pounce on the massive pile of copies of Spycatcher which were in the airport bookshop. I decided it would make a brilliant read for the return flight home. How wrong I was. It is the most boring book I have ever had the misfortune to start reading. It was impenetrable and I could not make past the first 20 pages. Indeed, it was so bad that I had to resort to re-reading the in-flight magazine, High Life for the umpteenth time. I blame Maggie Thatcher for introducing me to Spycatcher…! Like me, you may well have personal recollections of Lady Thatcher. But perhaps we should reflect for a moment where we would be online if it were not for Margaret Thatcher. Prior to her election win there was only one state-run telecomms supplier. If you wanted a phone line, you had to wait a minimum of six weeks. If you needed an answering machine you could have one – the only one available, a single model from the state supplier. And it is surprising to recall that if you wanted a holiday you would almost certainly book with Thomas Cook – which was state-owned until 1972. Britain was obsessed with state ownership. Can you imagine the Internet under state ownership? One broadband supplier? One router? One heck of a wait? True, some countries do have state-run Internet – but they tend to invest considerable amounts in their technology. Saudi Arabia, for instance, is not short of a bob or two. The fact that Mrs Thatcher spearheaded an entrepreneurial economy which set the path for individuals to earn money on their own account, rather than working under some set of rules cobbled together by trade union leaders and poor managers. It is this spirit which has helped the UK develop many leading Internet businesses and to be at the forefront of the mobile sector. But there is one other thing we should thank her for. Prior to becoming Education Secretary and then Prime Minister, Lady Thatcher was the UK Science Minister and was instrumental in supporting the funding and work going on in Switzerland at the CERN laboratories. The very laboratories where the World Wide Web was invented. You have to wonder, if she had not been so supportive, if she had not sign-off on the funding Britain provided, would the web have arisen? 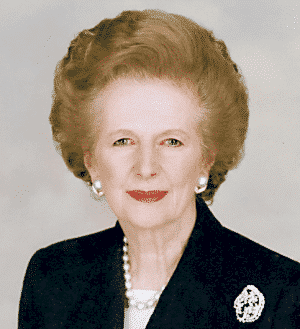 OK, I admit, probably it would have – but you cannot deny that in the web of politics, funding, science, research and striving for new things, Maggie was there, in the mix. She may not have been fundamental, but she certainly played a role. The Internet in the UK may not be the kind of thing we love today without her involvement.